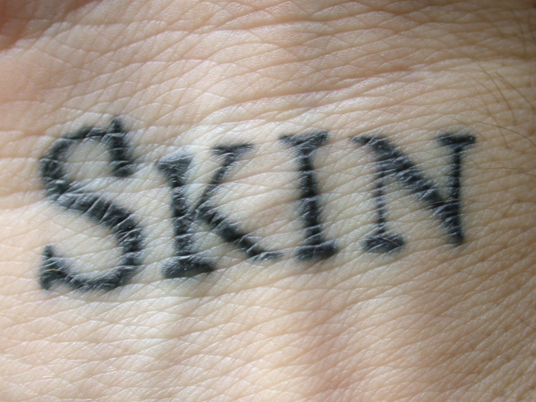 The Skin Project was launched in 2003. Jackson had a 2,095 word novella written, but as opposed to printing it on paper, she sought to present the story on the skin of many project volunteers. 2,095 volunteers, to be exact; one word for every person. They are not understood as carriers or agents of the texts they bear, but as its embodiments. As a result, injuries to the printed texts, such as dermabrasion, laser surgery, tattoo cover work or the loss of body parts, will not be considered to alter the work. Only the death of words effaces them from the text. As words die the story will change; when the last word dies the story will also have died. The author will make every effort to attend the funerals of her words. A large number of Jackson’s words will remain anonymous, but at least one is a fellow published author. The tattoo above right is on the forearm of none other than Rick Moody, writer of The Ice Storm. We may not be permitted to read or know the finished work, but as with Egan’s twitterature feature “Black Box,” it’s exciting to see a new fiction form emerge. To see more of the words, you can also visit the Berkeley Art Museum’s Archive to watch the video Jackson assembled of 191 volunteers reading their words aloud, which was arranged into a new “sub-Skin” spoken word piece.